Crowd chants for Taven before the bell. Code of Honor as the bell sounds. "Shave your mustache" chants directed towards Silas. Silas backs Taven into the corner, shoulder to the ribs and a gut shot. Silas piefaces Taven, but Taven with right hands. Silas with a side headlock takeover. Taven tries for an Irish whip, but Silas holds onto Taven's hair. Silas with knee strikes, then Taven slips out of a suplex. Silas blocks an O'Connor Roll, but Taven with an armdrag and a dropkick. Taven runs into double boots by Silas in the corner, but Silas misses a clothesline. Taven with a rana, then rolls through and hits a chest kick, followed by a standing moonsault for a nearfall. Silas rolls out to the outside, then as Taven is distracted by Truth Martini heading out to ringside, Silas gets back in and hits Taven from behind. Taven sent off the turnbuckles. Silas catches double boots and sends Taven onto the apron. Silas misses a right hand and Taven hits a roundhouse kick. Taven heads up top, crossbody for a nearfall. Silas avoids a corner charge and sends Taven back onto the apron. Taven with a shoulder to the ribs, then goes for a slingshot sunset flip, but Silas blocks it and stomps away at Taven. Chinlock applied, with Silas's knee driven into Taven's back. Back from commercial as Taven tries to fight out of the chinlock, but Silas slams him back down. Silas with a knee to the ribs and a forearm. Silas blocks Taven going up & over and crotches him on the ropes. Silas then springs off the middle rope and nails Taven with a clothesline that sends Taven all the way to the outside! Ref begins his 20 count as Silas yells at the ref to count faster. Taven gets back in, Silas gains a nearfall. Forearm as Silas trash talks Taven. Taven avoids a corner charge, enziguri, both men down. Silas misses a clothesline, Taven with a leg lariat. Silas misses a right hand, Taven with a spinning back kick, a front kick and a spinning side kick. Silas avoids a springboard with Taven landing on his feet. Taven misses a clothesline, but hits a superkick. Springboard moonsault for a nearfall. Silas comes back with a jawbreaker. Silas with the backbreaker part of the Killer Combo, but Taven avoids the clothesline. Silas blocks Angels' Wings, big clothesline for a nearfall. Silas is getting frustrated. Silas with the Finlay Roll. Taven avoids the Pee Gee Waja Plunge, hits the Cyclone Kill. Taven heads up top, Air Taven for the win. Taven celebrates his win, then adheres to the Code of Honor with Silas. Taven goes to leave, but Silas attacks him. Martini comes in and cheers Silas on as Silas lays out Taven. Martini goes to shake Silas's hand, but Silas walks past him and leaves the ring, with Martini clapping for Silas. Martini taunts Taven, but Taven comes to and chases Martini to the back. Back from commercial, we see video on how Hanson won the 2014 Top Prospect Tournament, earning a ROH TV Title shot in our next match. Pre-match intros for this one as both men stare each other down. Loud reaction for Ciampa. Code of Honor as the bell sounds. Both men instantly slug it out early, with Hanson taking over. Hanson runs into a boot, then Ciampa with a series of forearms and stomps in the corner. Down comes the kneepad. Ciampa off the ropes, avoids the Spin Kick of Doom by Hanson. Ciampa then BACK SUPLEXES HANSON OVER THE ROPES AND TO THE OUTSIDE!! Ciampa with a head of steam and wipes out Hanson with a no-ropes plancha! Hanson sent into the barricade and seated on a chair next to the barricade. Ciampa charges and hits a running knee while Hanson is against the barricade. Hanson placed on another chair by the barricade. Ciampa charges and hits another running knee. Back in, Hanson catches Ciampa with a spinning front slam for a nearfall. Hanson with a series of crossface shots to the head. Ciampa goes off Hanson's blind side, then catches him off a leapfrog attempt, Air Raid Crash for a nearfall. Strike exchange, with both men going off the ropes before hitting the other. Ciampa with 2 running boots, Hanson misses a clothesline and Ciampa with an enziguri, backing up Hanson again. Hanson with a CARTWHEEL, then TAKES CIAMPA's HEAD OFF with a clothesline for a nearfall. Ciampa slips out of a slam, roll-through into a Knockout Knee, but Hanson kicks out! Ciampa is starting to get frustrated. Ciampa goes for Project Ciampa, but Hanson drives him into the corner. Series of back elbows by Hanson, then hits a Bronco Buster in the corner. Hanson heads up top, MOONSAULT!!! 1-2....NO!! Ciampa quickly locks Hanson in the Sicilian Stretch, but Hanson GETS TO HIS FEET WITH CIAMPA ON HIS SHOULDERS! Ciampa slips out, SPIN KICK OF DOOM!! However, Ciampa rolls out to the apron. Hanson tries to bring Ciampa back in, but Ciampa clings to the ropes. Hanson with chest clubs, but Ciampa comes back with a leaping knee. Ciampa heads up top, but Hanson stops him. Hanson heads up with Ciampa and goes for a Super Samoan Drop, but Ciampa slips out. Ciampa then goes underneath Hanson, lifts him up from the out of the corner, PROJECT CIAMPA!!! 1-2-3!! WOW!! Ciampa celebrates his title retention afterwards, then adheres to the Code of Honor with Hanson. Crowd gives Hanson a nice ovation and chants for him. Ciampa & Hanson then hold the ropes open for each other as they leave. Back from commercial, we see video on how Chris Hero earned his ROH World Title shot in tonight's main event. 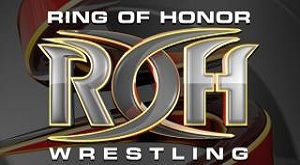 ROH match-maker Nigel McGuinness comes out before the main event and says for ROH World Title matches, you want a clear winner and a clear loser, none of that "sports-entertainment" stuff. So, I have made sure that Jay Briscoe, Michael Elgin, Michael Bennett & Maria Kanellis have left the building and gone back to their hotels, so there will be a clear winner, a clear loser and the best damn wrestling in the world. Nigel joins commentary for the main event. Pre-match intros for the main event. Big reaction for Hero. Code of Honor before the bell. Hero instantly locks in a cravate, Cole quickly gets to the ropes. Hero grabs Cole's leg, takes him down, gets a 1 count. Pinning predicament for a nearfall. Cole goes to the outside to re-group. Hero motions for Cole to get back in. Cole wants a knucklelock, but Hero catches a gut kick, roll-up for a nearfall. Chop, then Cole applies a side headlock. Cole with a shoulder tackle, then yells "Adam Cole BAY-BAY!!" Cole goes for a leapfrog, but Hero catches him in mid-air with a boot to the chest for a nearfall. Chop and a slam by Hero, followed by a back senton for a nearfall. Spinning senton for a nearfall. Cole backs Hero into the corner and stomps away. Cole has words with the ref, but then Hero comes back with another chop. Cole holds onto the ropes to avoid a boot and goes back to the outside to re-group. Cole stalls for a bit, then breaks the ref's count. Hero is getting upset as Cole says "You gotta beat me!" Hero goes to the outside and begins giving chase. Cole starts running, but runs right into a boot by Hero as Hero drew Cole in. Another Mafia Kick by Hero. Back in, Cole avoids another Mafia Kick by Hero and goes to the apron, but Hero, not to be denied, still hits Cole with it, sending Cole back to the outside. Hero with a head of steam, but Cole avoids it and sweeps out Hero's legs from the apron, then hits an enziguri. Back in, Cole gains a nearfall. Forearm and an elbow to the back of the head. Cole chokes Hero in the ropes. Hero comes back with a chop, but Cole with a kick to the head. Cole off the ropes and applies the Ultraviolent Chinlock. Hero tries to get to his feet, but Cole takes him back down. Crowd wills on Hero. Cole with a gut kick, but Hero with a knee to get out of a suplex. La Magistral for a nearfall. Cole comes back with a Shining Wizard for a nearfall, then the crowd makes fun of Cole's grunting when someone kicks out. Cole tells the crowd to "shove it", then hits a series of right hands to Hero, but each one fires Hero up more. Cole yells at Hero to "stay down", but Hero comes back with a series of chops. Hero goes for the rolling elbow, but Cole with a kick to the knee. Cole points to his head to show how smart he is, but the crowd again makes fun of his grunting. Cole goes for a suplex, but Hero counters it with the Crash Landing. Crowd chants for Hero. Cole runs into a knee strike, misses a clothesline and Hero hits a running neckbreaker, followed by a flipping neckbreaker. Hero charges and hits a running forearm in the corner. Hero catches a Cole kick and hits a knee strikes, sending Cole to the outside. Hero then with a running dropkick through the bottom and middle ropes, sending Cole crashing into the barricade! Hero is all fired up. Back in, Hero with a slingshot curb stomp to a doubled over Cole, followed by the rolling elbow, but Cole kicks out! Hero is starting to get frustrated. Hero goes for the Electric Death Blow, but Cole slips out. Hero blocks an O'Connor Roll and hits a sliding dropkick. Cravate Suplex for a nearfall. Big right hand and a Mafia Kick in the corner. Hero places Cole up top and goes up with him. Cole knocks Hero off the ropes, but Hero with another Mafia Kick. Hero heads back up top and locks in a Cravate, but Cole sends Hero onto the apron. Cole misses a forearm off the ropes, but hits a pump kick. Cole drapes Hero across the ropes, PANAMA SUNSET!! 1-2...........HERO KICKS OUT!! Cole can't believe it as the crowd continues to mock him. Cole talks trash, but the crowd just continues to mock him. Cole piefaces Hero and tells him to stay down. Cole does another "Adam Cole BAYBAY! ", but then Hero with a short hook shot that knocks out Cole! 1-2.......NO!! Hero lifts up Cole and says "Adam Cole is DEAD!!" ELECTRIC DEATH BLOW, but it sends Cole to the outside! Hero tries to lift up Cole, but Cole is dead-weight. Crowd chants "You killed Cole." Hero rolls Cole back in, but Cole rolls back out to the outside. Hero then charges and hits another Mafia Kick. Hero goes to put Cole back in, but Cole counters with a RELEASE GERMAN ON THE OUTSIDE!! Back in, Cole with the brainbuster across the knee, but HERO KICKS OUT AGAIN!! Cole can't believe it! "This is awesome" chants by the crowd. Cole goes for the Florida Key, but as Hero tries to get out with a back elbow, he accidentally hits the ref, knocking him down and all the way to the outside. Hero blocks a Cole superkick, HERO's WELCOME, STRETCH PLUM ALPHA, COLE TAPS, but there's no ref!! Nigel checks on the ref as the crowd chants "you tapped out." Hero releases the hold and goes to see what is going on. Hero goes for the Death Blow, but Cole slips out and hits an enziguri. Hero with another Mafia Kick, but Cole with a pump kick. Hero goes for another rolling elbow, but Cole catches him with a superkick as the ref gets back in. FLORIDA KEY, HERO KICKS OUT!! Cole holds on, 2 more FLORIDA KEYS!! 1-2-3!! Cole celebrates his title retention as Nigel sees the replay that shows Cole tapping out while the ref was knocked down. Crowd chants "you tapped out" at Cole, but Cole shows off his belt to the crowd. The crowd mocks Cole again, but he yells "Adam Cole BAYBAY!!" as we close the show. Wrestleview.com is not affiliated with World Wrestling Entertainment (WWE) or TNA Wrestling in any way. In addition, we are not affiliated with any independent professional wrestling organization. All pictures and media files are copyrighted by their respective owners.